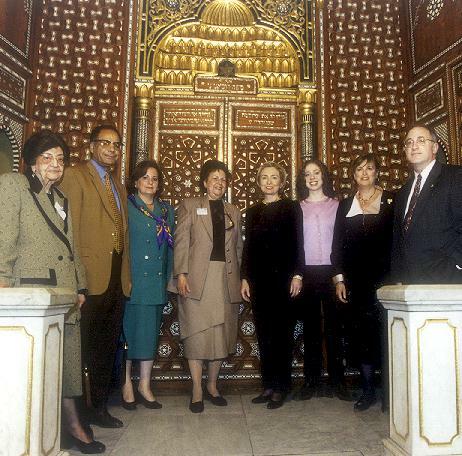 Earlier this year, the Jewish sites of Cairo welcomed two very important visitors: Hillary Rodham Clinton accompanied by daughter Chelsea. 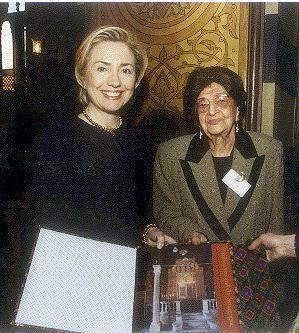 On March 22 Hillary Clinton was welcomed at Ben Ezra's main gate by JCC president Esther Weinstein (see picture) and JCC's board member and PR director Carmen Weinstein. After touring Ben Ezra, the American first lady was presented by JCC president Esther Weinstein with a beautiful volume on Ben Ezra published by Phyllis Lambert of the CCA - Canadian Center of Architecture shortly after the celebrated synagogues' restoration a few years ago. 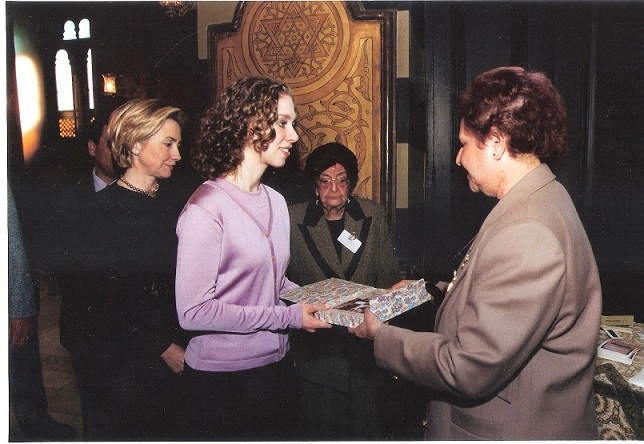 Chelsea Clinton meanwhile, was offered the book "Maadi 1904-1962; Society & History in a Cairo Suburb," about a multi-ethnic, multi-racial suburb of Cairo where Jews of many nationalities played an important role and left an important architectural and cultural legacy. 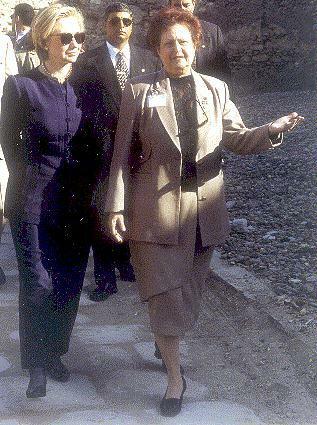 Accompanying Hillary Clinton were Mr. Gaballa Ali Gaballa, head of the Egyptian Antiquities Department and Mrs. Abdelrehim Shehata, wife of the the governor of Cairo. (For more photos on Hillary's visit click here). On March 30, it was the turn of American congressman Benjamin Arthur Gilman of New York (head of the Foreign Relations Committee) to visit two of Cairo's Jewish sites. Coming straight from the airport, Gilman, his wife, and a congressional entourage visited Bassatine Cemetery before being motorcaded to Ben Ezra. Accompanying them was Carmen Weinstein, JCC photographer Norbert Schiller and JCC legal counsel Youssri Abdel Dayem. Two days later, Gilman celebrated Seder (the traditional passover) at the Israeli ambassador's residence in Maadi, just one block away from the Meyer Biton Temple. (For more photos on Gilman's visit click here). Meanwhile, the surrounding grounds have been landscaped, re-seeded and the mango trees pruned. The caretaker's cottage has also been refurbished so that Meyer Biton's garden is now the venue for picnics and other social events. However, the work is far from over and done with. The synagogue cupola still needs structural attention (Est. cost US$ 3,500) and the walls could do with a paint job (Est. cost US$ 1,900). Here and there the marble flooring needs to be re-aligned (Est. cost US$ 2,000), and the ancient dog-eared rug has to be replaced (US$ 500). There is also the question of a gardener and general maintenance. Both amount to an aggregate annual cost of US$ 2,500. Which is why any donation sent to the JCC ref: "Meyer Biton Temple" would be most welcome. A brass plaque recognizing each donator will be placed on an appropriate bench. BN invites all visitors to Egypt to call the JCC and fix and appointment for an on-site visit to the Meyer Biton synagogue in Maadi. At this point we must thank Mireille Lennos nee Stambouli (yes, Raymond's sister) who visited Meyr Biton early June and gave us invaluable horticultural advise. If anyone knows about plants and flower beds it is most certainly Mireille who looks after her own beautiful garden in Tourettes-sur-Loup outside Nice, South of France. Earlier this year Leon Sion, presently of 1 Sq. de Chanaleilles, Residence, Varenne, Parly 2, 78150 Le Chesnay, France, formerly of Egypt, visited Bassatine where he put a new tombstone on his mother's grave. By so doing Sion identified what was heretofore an unmarked tomb. By his noble action, Sion will have help others to recognize nearby graves belonging to their family or friends. We therefore urge anyone who knows the whereabouts of his/her family grave to kindly inform the JCC. Recognizing that many of you cannot remember the exact or approximate location, you may however recall the occupants of neighboring tombs or plots. This information will help to set a master plan for the Bassatine cemetery, which, as you may have read in our ealier issues, lost most of its tombstones during the 1960s. Another visitor to Bassatine was Elie Cohen, former editor at the weekly al-Chams newspaper founded by Saad Yacoub Malky in the 1940s. 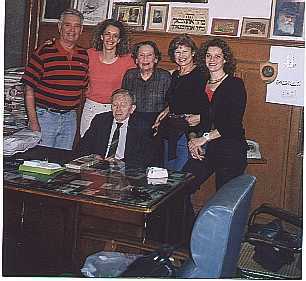 Visitors to other Jewish sites included Racheline and Joe Barda from Australia (formerly of Alexandria). They share with us highlights of their recent trip in the next section of this BN's issue. Also visiting Cairo was Jacques Menasche a sometime New York city photographer currently researching the buildings constructed in the 1930s and 40s by his late grandfather Moise "Maurice" Menasche formerly of No.  10 Tewfik Street, Heliopolis and later No. 5 Sekkat al-Fadl, Cairo (next to the French Consulate). Also in town this season were Rolando Schinasi formerly of Immeuble Ades on al-Fadl Street, near the French Consulate (now of Milano & Nice-Cote d'Azur), as well as Reginette Scheferman and her two daughters from Washington DC. Reginette was born to Mayer Sofair-Haboush of 14 Mosseri Street, Maadi. Having just come back from Egypt after an absence of forty-two years, I want to share with you some of the thoughts and feelings I have experienced. First of all, I have to admit that for quite a long time, I didn�t really want to go back to my country of birth. It was not because I had forgotten the sweet years of my childhood in Egypt, but because of the bad memories I had of the last few months before my departure. Nevertheless, my husband Joe (known also as Giusy) persuaded me to undertake this trip together with our two daughters who live respectively in Paris and Tel Aviv. Unfortunately, my son, who is a publisher in Sydney, was not able to join us. Singapore Airlines took us direct from Sydney to Cairo. As we were landing, I start feeling quite apprehensive, wondering what kind of welcome we would be getting. The old fears that I remembered from the bad old days, the fear of the arbitrary, come back to me, and I whisper to Joe, please don�t speak Arabic. Let�s first see what the atmosphere is like. Of course he laughs at me. He has already come back to Egypt once before, fourteen years ago, and feels quite relaxed about it. The knot in my stomach unravels gradually as we are warmly greeted by a smiling and pleasant young man who introduces himself in perfect English as our tour operator and says the magic words, welcome to Egypt! He takes charge of everything, tickets, passports, luggage, customs formalities and after a relatively short time, we are heading towards our hotel, mesmerised by the traffic, the noise, the huge buildings, trying in vain to recognise familiar places from our past. Passing through Heliopolis where I used to spend many school holidays, I want to revive my memory of the place but to no avail. The guide tells me the Roxy cinema is still there and so is the statue of the Baron d�Empain and still nothing seems familiar. Maybe it�s me, maybe I had not paid enough attention when I was a little girl thinking there will be ample time and other opportunities to come back and take note. Now, although frustrated not to find any �point de rep�re� from my childhood, I draw some comfort from the fact that after all, Cairo was never my city. I was an Alexandrian. Alexandria will not be a stranger, in spite of the long years of separation. We check into the Marriott Hotel, in Zamalek. Originally, it was a beautiful palace built at the time of the inauguration of the Suez Canal and it had welcomed the Empress Eug�nie. Our room overlooks the tennis courts of the prestigious Guezirah Sporting Club, where my husband competed in the 'Omnisports' events back in 1954, while representing the Alexandria Sporting Club. Not wanting to waste one single minute, we leave the hotel for the usual tour of the Mohammed Ali mosque and the Citadel as well as a visit to Khan Khalil. As we stroll down the narrow alleys, we are greeted and enticed into the shops in such a nice and friendly way that we cannot resist the invitation. We chat and joke in English and Arabic with the shopkeepers. They seem so happy to hear us speak in our broken Arabic that they nearly forget to push their wares as they would to ordinary tourists. They offer us coffee, drinks, wanting to know our whole story, the usual why, when, where? They are too young, they don't know about the past. We rediscover the charm, the hospitality, the gentle nature of the Egyptian people, the flowery language and the flowing compliments. It doesn't matter that they probably don't mean half the things they say; it just warms our heart and makes us laugh with delight. That same night, our daughters arrive and early the next morning we leave with our driver for Alexandria. That is the part of our visit that means the most to us not only because we were born here but because we want to show off our beloved Alexandria to our daughters. After checking in at the Cecil Hotel, first stop of this nostalgic pilgrimage, we start our voyage of rediscovery without even unpacking. We don't want to miss the sunset from the top of Stanley Beach. Again we expected the overcrowding, the traffic and the general state of decay so we are not too surprised. We are too busy trying not to miss any of the sites that had played such an integral part of our growing up years. We compare notes with our souvenirs. My husband navigates with such ease one would think he never left the place. I stay silent, thinking, trying to take it all in, the sights, the smell of the sea, the familiar names, Athin�os, Trianon, Sidi-Bishr. The Corniche is still as I remember it, stretching as far as the eye can see, beautiful and alive. I cannot believe the Casino Chatby is still standing, although it looks quite unstable, like some of my memories. We go from place to place pointing out to our daughters: this is where I caught the tram everyday to school, this is the beach where I spent the whole summer, this is where we used to buy falafel or grilled corn or Turkish cheese with doah and koulouria, this is my school and this is my school. Our beloved schools that probably shaped us into what we are today! The Lyc�e fran�ais, now called Lyc�e El Horreya, where I spent the best years of my life, has not changed much in my eyes, probably because they are full of tears. It�s just a little bit tired, a little bit worn. We knock at the doors of both our homes, in old Camp de C�sar and are welcomed with open arms by complete strangers, welcome back, come in please, this is your home, "etfadallou, anestouna"! The visit to the Barda's family villa is charged with emotion, especially when Joe recognises most of the furniture and even some ornaments that his parents had to leave behind, back in 1956. Our next stop is the Jewish cemetery where Joe wants to put some flowers on his grandparents' grave. As we walk amongst the many graves and the magnificent marble mausoleums, we read out all the names of the people who once constituted such a vibrant and thriving community. We are proud and sad at the same time to show our daughters the proof of a world that once was and is no more. The next day is totally devoted to a visit to the Jewish Community office in Rue N�bi Daniel. We want to check some family records and dates going back to the 1830�s. I also need to ask some questions related to my research on the Jews of Egypt. The hospitality and cooperation extended to us by the aging President Mr. Joe Harari and Madame Mattatia is touching. They both serve the community and run its affairs with dedication, commitment and dignity. Madame Mattatia opens the synagogue just for us. We point out to our daughters the magnificent pink marble columns, the wooden benches still bearing all the familiar names of members of a congregation long gone. I feel a shiver running down my spine. Our past life here which, even for us, with the passing of time, had acquired mythical qualities, was no myth. We had not dreamt it. I remember all the weddings I attended in this very same synagogue, either as a flower girl, or holding one of those fat and tall candles in a pretty, fluttering dress. I remember the numerous photos taken with my family on the front porch of the synagogue. I even had my batmitzvah in this synagogue, which was quite unusual at the time. When we eventually return to Cairo, we try very hard to meet with Mrs. Carmen Weinstein, who is doing such a wonderful job for the Cairo Jewish Community. Unfortunately, she is too busy to see us personally on such short notice. Instead, we are confronted by a gentleman who introduces himself as the lawyer for the Jewish community. He asks us quite curtly what is it exactly that we want. He is obviously suspicious of our motives and at first we are taken aback by his reaction. Eventually, after I explain to him that I am conducting some research on the Jews of Egypt for a Ph.D., he mellows and we chat cordially enough for a little while. 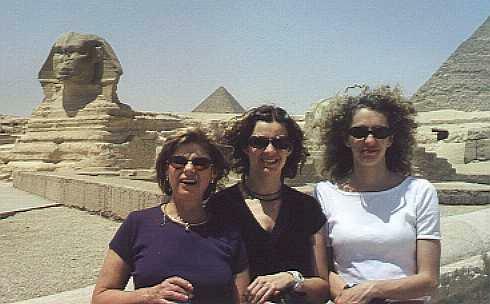 This will prove to be the only time during our whole visit in Egypt we would experience some unpleasantness. We still manage to visit the beautiful Adly St. Synagogue as well as the superbly restored Ben Ezra Synagogue in old Cairo. I also make contact with Samir Raafat who tells me about the wonderful Bassatine News website. Furthermore, he indicates to me his book on the history of the Cairo suburb of Meadi. His research recalls the enormous role played by quite a number of well-known Jewish families in the development of the whole area around it . We end our visit on a high note, a fascinating trip up the Nile from Aswan to Luxor with a side trip to Abu Simbel, all of which we had never seen before. The sophistication of the ancient pharaonic civilisation is amazing. On the boat, the crew treats us as long lost family when they discover we were born on Egyptian soil. Every day, the chef cooks for us some of our favourite dishes like melokheya, bamia, roz, lamb stew and others. The boat is beautiful and meticulously clean. Although the heat is quite unbearable in the middle of the day, we manage to sit on the top deck in the late afternoon and watch the Nile go by. However, all good things come to an end and it�s time to say goodbye although there is still so much to see and do. Now that I am back in Sydney, the place I now call home, I reflect on my visit to what was my first home. I feel richer having gone back and also liberated in a way. The barrier that stood between me and Egypt for so long has tumbled. I am proud of our daughters who had the sensitivity to see beyond the dust and the dirt, beyond the years of neglect and visualise how we had lived our lives. At the same time, they still appreciated what they saw of modern Egypt. The warm welcome we experienced everywhere we went touched me beyond words. Most of all, I was impressed by the level of education attained by people like our various guides, tour operators, drivers, people who would have been totally illiterate only a couple of decades ago. Even though I know that with the galloping demography of Egypt, a lot remains to be done, I am happy to see how much has been achieved already. I look forward to my next visit hopefully in the not too distant future. Thanks to the efforts of "Student Abroad" Aaron Kiviat, a second group of multi-national students from Cairo's American University help clear up the function hall of Chaar Hachamayim Synagogue's annex (below the library) on Cairo's Adly Street. Next came the workers who proceeded to remove the old rotted flooring replacing it with new tiles. Now an entire floor is ready for use for community celebrations and functions. We would like to thank several donors who wish to remain anonymous for making the above renovations possible. 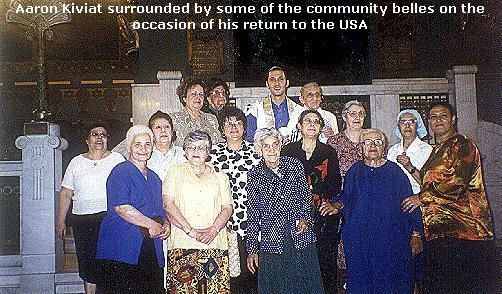 It was at the same synagogue that a farewell brunch attended by members of Cairo's Jewish community was held for Aaron on the occasion of his return to the West Coast last May. We wish him great success. Besides the benefits resultant to the JCC of such an undertaking, the student will have a unique opportunity of learning Arabic and, time permiting, of attending courses of his/her chosing at the American University in Cairo. The student would need some basic knowledge of French and Hebrew. A frequent visitor to Cairo read somewhere (he did not specify where) that a synagogue "entrance fee" was being charged. The sender does not recall ever being asked to pay a fee and therefore expressed his indignation at such malicious insinuations. BN and the JCC share Dr. Rudolf's concern regarding these unfounded allegations. As far as the JCC is concerned, an entrance fee has never been and will never be levied at any house of worship. To the best of the JCC's knowledge the synagogues in Cairo have not been turned into museums... yet. As a follow up to the above item, it has very recently come to the JCC's attention that people wishing to visit the Bassatine Cemetery are asked by the JCC-employed gatekeeper for "entry fees." This is of-course ABSOLUTELY unacceptable. The JCC has in the past, and continues to do so in the present, requested all would-be visitors to the Bassatine cemetery to contact anyone responsible at the Synagogue on Adly Street or, alternately, to contact the JCC president at the Weinstein Stationary Store at 28 Cherif Street or at the Rabbinate in Abbassia in order to obtain a "pass" enabling them to visit the gravesite unhindered. Needless to say disciplinary action will be taken against the present gatekeeper up until such time as a more appropriate solution can be devised. 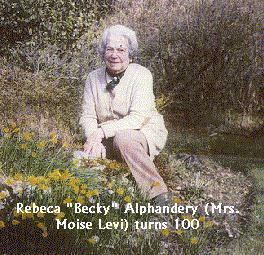 Nicolette Mawas nee Pinto sent us the following family memoir. BN is pleased to publish it unedited. I have just received from a member of my vast family, the photo of my great-grandfather, Dr. Elia Rossi. He is dressed in a grand uniform, covered with medals and decorations. 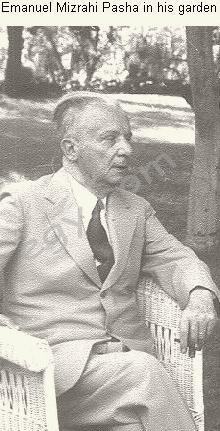 He was the Kaimakam Dr. Elia Rossi Bey, private doctor to the Viceroy of Egypt, Mohamed Ali, at least according to family tradition. Elia arrived in Alexandria in 1838, having just completed his studies as a medical doctor in Ferrara where he was born in 1816. The legend goes that as he was sailing towards Alexandria, a devastating storm destroyed the big mast of the ship carrying him, off the coast of Sicily. The passengers survived , the mast was repaired and all proceeded their voyage towards Alexandria. As soon as Elia arrived, and without any knowledge of Arabic, he was sent to Hedjaz, as an Army doctor. He proceeded to develop a taste for exploration, geography, natural history, and travelled up and down the Nile, up to Nubia. On one of his trips, the story goes, he had to cure the Prince (which one I do not know) from the bubonic plague or else!.. and he did just that. Around 1845,he married Bamba ,a young Cairene girl of 14,whose father had died, and whose mother, I discovered very recently,was Mrs Yacoub Cattaui's sister.Regina, Bamba's mother, after been widowed, was whisked to Paris by her new husband, Baron Dauvignon, probably connected with Napoleon's Expedition d'Egypte.I recently saw, in the house of a cousin, daughter of Gaston Rossi,an architect who had designed many important buildings in Cairo and Alexandria, a pastel portrait of this beautiful lady, who, by accounts of people who knew her at the time, was the belle of the ball,in Paris, and even danced with the Duke of Orleans. Elia and Bamba had 12 children. Two girls died in infancy, one son at 30, another was murdered during the Revolution of June 1882.The others married into Jewish families of Cairo and Alexandria. Two children married Cattauis,one son married a Tilche,the older girl married a Viterbo, another a Negrin, and they all had many children! One of them, the black sheep of the family, married an Italian ballerina against his family's wishes and produced 9 children before succombing to TB. Elia Rossi died in 1891, some say of a broken heart at the loss of his two sons. He was 75, had written a large amount of books, mostly on medicine, natural history and hygiene, also on geography.His wife survived him until 1909, and my grand-mother Ines lost her father at the age of 21, being The youngest of the family. I was lucky enough that she had recorded all the dates of birth, marriage and death in her Prayer Book, which is in my possession. Very little was said, while I was growing up, on this extraordinary man, and his family.All I knew is that he had introduced the mango tree in his Choubrah garden. That first had been recorded in the family! Nothing else was that important. This issue's incomplete Rossi family tree is about the Elia Rossis of Cairo and Alexandria. See if you can add to it. 1. 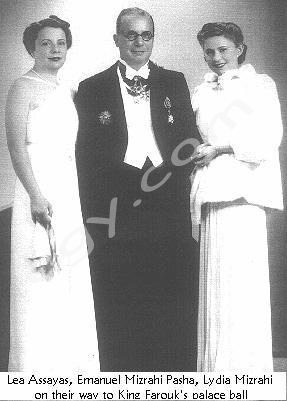 Niza Grunberg (daughter of Henriette and Isodore Grunberg) formerly of Maadi became Madame Jean-Pierre Chevenement (see picture to right). 2. 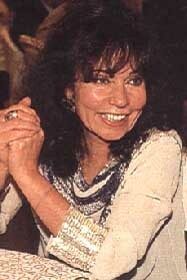 Suzy Ambache formerly of Zamalek became Mrs. Abba Eban. 3. Lili Solomn Cicurel formerly of Giza was the wife of French Prime Minister Pierre Mendes-France. 4. 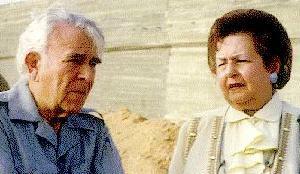 Yollande Castro formerly of Giza became Lady Keith Joseph (wife a Thatcherite cabinet minister). 6. Leah Nadler of Alexandria became Mrs. Boutros Boutros-Ghali, former UN boss. Answers will be posted next BN issue. The first ever Jewish brigade since Biblical times was called the Zion Mule Corps. It was created in Alexandria in April 1915 and placed under the direct command of British officer J. H. Patterson. Also Serving as officers in this unique corps were two Alexandrians: Claude and Ibram the sons of banker-merchant Jacques Rolo. Most of the recruits were immigrant Russian Jews who had fled Ottoman Palestine at the outbreak of WW1. On 17 April 1915, following a three-week training stint in the refugee camps of Gabbari and Wardan (both outside Alexandria) the newly formed 500-strong brigade, along with their gear and 750 working mules, embarked for Gallipoli aboard HMS Hymettus and HMS Anglo-Egyptian. But before leaving the men received the blessings of Grand Rabbi of Alexandria, Raphael della Pergola. The celebration which took place in Alexandria's famous synagogue on Nabi Daniel Street was attended by community elders Messrs Edgard Suares, Isaac Aghion and de Picciotto amongst others. Due to losses in life, the brigade was beefed up in July of the same year with Jewish new recruits from Cairo. The availabilty of 150 able-bodied men was made possible thanks to the efforts of Moise Cattaui Pasha and Hebrew scholar Jacques Mosseri. King Farouk delegated 4th court chamberlain Saleh Younes Bey to offer his condolences. Joel Beinin's book THE DISPERSION OF EGYPTIAN JEWRY is perhaps the most authoritative work on the subject of post 1948 Egyptian Jews. This work is thoroughly researched from interviews, documents, newspaper articles, and many other sources. While displeasing critical historians and some academics in Israel because of its frankness, this book is DEFINITELY a must-read for students of Middle Eastern history and colonialism in that part of the world. In his provocative and wide-ranging work (329 pages), Joel Beinin (professor of history at Stanford University) examines fundamental questions of ethnic identity by focusing on the Egyptian Jewish community since 1948. 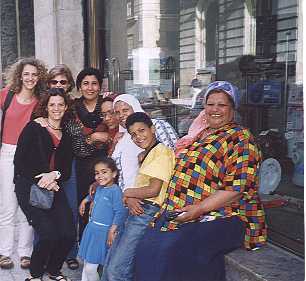 A complex and heterogeneous people, Egyptian Jews have become even more diverse as their diaspora continues to the present day. Which is why, for Egyptian Jews, this book serves as a valuable reference for their decendants of the conditions which directly and indirectly affected Egypt's Jewish community between 1948-67. it will also help them better understand their origins and an era that no longer exists. 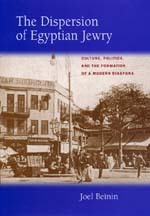 The Dispersion of Egyptian Jewry is quoted by James Jankkowski, coauthor of "Redefining The Egyptian Nation" as "The best sort of historical revisionism--sophisticated but unobtrusive in its use of theory, consistently contextual in its assessment of sources and texts, open-ended and suggestive of broader implications in its conclusions." "The Dispersion of Egyptian Jewry" was also extensively reviewed by Kassem Abdou Kassem in Weghat Nazar Issue No. 6 July 1999, a monthly Arabic-language literary magazine (check alkotob.com still under "tedious" construction). If most of Kassem's remarks were harsh and accusatory, nevertheless the length of his expose (six broadsheet pages) belies the reviewer's obvious and transparent interest in Beinin's extensive research. 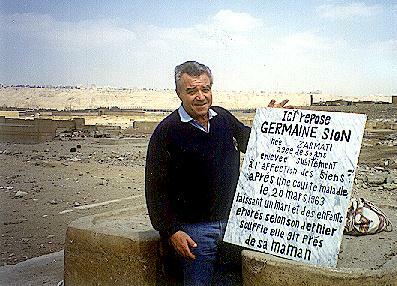 Beinin last visited Egypt with his son in July 1998. 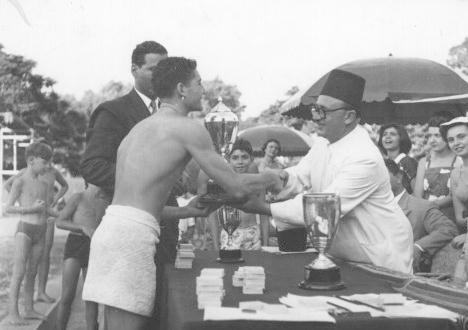 Rolando Schinasi receiving cup from Mohammed Taher Pasha (?!) for winning 200 m. Butterfly. Coach Hamdi Elwani stands next to him.